The first week of June actually brought in a series of severe weather events. June 1st started with a vigorous area of low pressure traversing the Canadian border. As its associated cold front drove into the Midwest, scattered thunderstorms developed. While most were not severe, one storm in Shelbyville, IN downed trees and even blew off roofs of farmhomes. Another storm system made its move to the area on the 4th with a further southerly track. Again, severe weather reports remained sparse but storms in Ohio led to multiple wind damage reports and even a few tornadoes. In fact, this system impacted the Buckeye State for the next three days becoming the first consecutive three day period that the Storm Prediction Center in Norman, OK received damage reports for Ohio this year. After a couple of minor and isolated events followed with some hail reports across Rockford, IL and North Chicagoland on the 9th, the 14th marked a turnaround in which severe weather became more widespread. A warm front pushed groups of thunderstorms through northern Illinois and southern Indiana with storms becoming more widespread as they migrated eastward on the 15th. Wind damage reports spanned from southern Illinois to Columbus, OH, including reports of six inch thick tree limbs downed at Cincinnati/Northern Kentucky International Airport. One more round of thunderstorms on the 20th produced gusty winds and even a tornado close to Cincinnati in Waynesville, OH. The month’s most significant severe event happened to be the last of the month, plowing through the heart of the Midwest from the 22nd to the 23rd. As low pressure entered northern Illinois, it pulled warm and humid air out ahead of it. A stationary frontal boundary and cooler air nearby set the stage for a battleground between clashing air masses. Together, instability increased and high winds in the upper atmosphere countered much lighter winds at the surface. This twisting of the air between the ground and aloft created the necessary rotation for thunderstorms to develop into supercells, many of which resulted in tornadoes. Severe weather report map showing several instances of tornadoes through North Central Illinois (left). 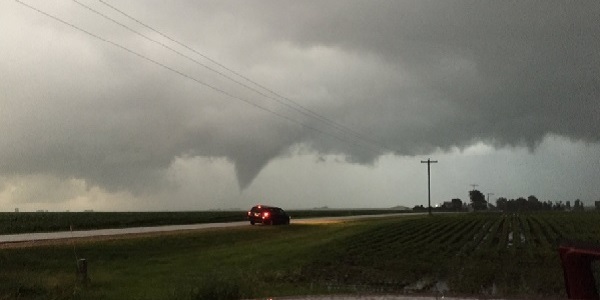 Resulting damage from one of these tornados, reported as an EF-2 with winds of 115-125 mph (right) - Both via National Weather Service, Chicago. Widespread damage reports came out of this outbreak with most tornadoes ranked as EF-1 with winds between 86 and 110 mph. The area hardest hit was Pontiac, IL where surveys indicated an EF-2 tornado touched down, producing winds up to 125 mph. 21 tornadoes touched down on this day with gusts up to 87 mph and 100 mph reported near Lafayette, IN! Along with high wind reports, storms dumped very heavy rain. In fact these storms produced as much as 50 to 75% of Illinois’ total rainfall for the month, with areas reporting anywhere from 1 to 3 inches of rainfall. Severe storms traversed downstream with a pair of tornadoes across Warren and Clinton Counties in Ohio. High pressure then took over in the system’s wake, dominating the final week of the month. June ended up changing the pattern seen over previous months and finished warmer than normal. The mean temperature of 71.6 degrees at Chicago’s O’Hare airport finished as the 8th warmest June on record, with Rockford’s 71.8 degrees ending up as 11th warmest. The most notable high temperature was observed in Columbus, OH with 95 degrees on the 11th, tying the daily record set in 1956. The month finished on a high note not because of extreme periods of heat but because temperatures consistently remained warm through the month. In fact, most of the Midwest finished 2 to 3 degrees above normal for June. As is expected during summertime months, rainfall was much more variable thanks to the scattered nature of thunderstorms. 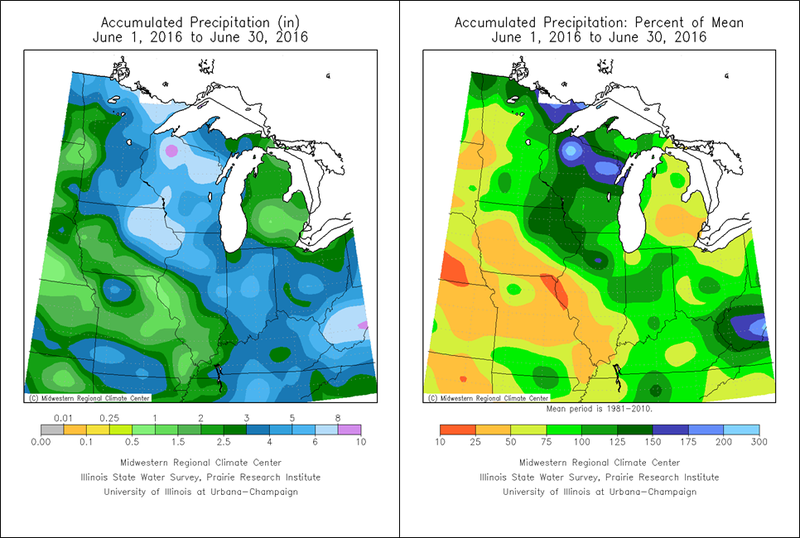 Overall, June ended up being a run-of-the-mill summer month from Chicago, IL to Columbus, OH. Although it was devoid of record heat waves, it featured the Midwest's most significant severe weather of 2016. Will July usher extreme heat and even more significant weather to the Corn Belt States? Be sure to read next month’s newsletter to find out!